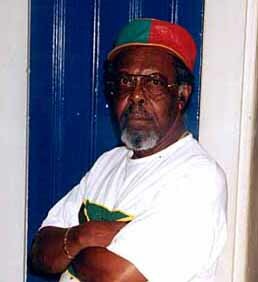 Lloyd Knibb's importance to Jamaican music can't be overstated. The inventor of the ska beat at Coxson Dodd's Studio One, Knibb created a sound that spread like wildfire the world over. In 1998, the musical debt to Knibb grows, as ska has proliferated to its furthest extent ever. The following interview took place on March 23rd, 1998 in Lincoln, Nebraska. I was joined by Lincoln's resident Jamaican music authority and my sometimes radio co-host, Dan Batman. Regarding Winston Grennan, you were telling me last night that you did an interview together and . . . He was talking to a girl in the college place in Albany. I went to play, and he was our driver. It seem as if he know this girl very well, because he told me that it was his girlfriend and all that. She started to interview him, and he started to tell her he was the originator of the ska beat, and I says 'Winston mon! What kind of thing is that?' He just gwan and gwan, me just love him, because [he knows it] was me. So do you know how far he really goes back? So tell me, there are a couple of things I want to know, first about your drumming and also the history of percussion and different African styles in Jamaica. You are credited with the burru style. How would you differentiate . . .
Well, burru coming from calypso to the funde and the Rasta drumming, the repeater, kette and thing like that. When I used to be around Count Ossie and Count Ossie have a burru band. So you used to play the repeater, and you have the bass drum and then you have repeater, three of them. He kinda improvise, so one man playing 'bop bop, bop bop' (heartbeat rhythm --cvp). That's the heart. Then the other guy going to play, 'boom . . baff . . . boom . . baff' (alternate beats, 1&3 like the standard 'one drop' drum and bass pattern). Then the repeater mon now, 'too too kete ki teng ke, tetoto toom toom toom, toto plang plang te toto plang' (I won't attempt a musical transcription of this -- cvp). But meanwhile you have to concentrate on funde, play off of the funde and the bass drum. So now it is only I alone concentrate and play everything. I play all three drums. The bass drum, the funde and the repeater. So I mix all that with the ska music and create a sound. Every now and again I put in a piece of that. Coming from jazz, we used to play a lot of jazz with Eric Dean's band. He used to play a lot of Latin tunes, Glen Miller stuff, cha-cha, bolero. Was that your first professional work? No, that wasn't my first. My first professional work was in the Val Bennett band. Gabriel, a trumpeter I used to know for a long while, he introduced me to Val Bennett band. He said they wanted a drummer, and is only I alone take [the old drummer's] place, so I went. Everything was all right, and from Val Bennett band to Stanley Headlam band to different different band, Jack Brown. Eric Dean's was the most stable one, cause he last a very long time until he went to England, some home troubles. Him break the band to go to England. He died in England. So with all those different beats, we used to play calypso, rumba -- they're almost the same kind of sound. And we used to play quadrille, which is a mixture tune, pure calypso sound. So all those sound put in one with the jazz and everything that I know. I put everything in the ska music. Did the folk sound that they call mento come from quadrille? Mento is same kind of rumba. You call it rumba-mento. Is just a different name a different sound, different beat. Rumba box, that is played by a calypso band. That is being used in a calypso band. Sometimes is three or four blades in the hole [in] the box. Is a box like a [television], but it have a hole in the middle and four steel blade, broad belt like barrel steel -- the steel they put around a barrel. Well, they cut those and use those for the different different bass notes. Then you have a banjo. We used to use banjo first time, cause we never used to have electric [power] in Jamaica, and electric guitar . . . we used to haffe use a banjo. When you're going to the country to play, you haffe use a banjo, you can't use a guitar, cause a guitar is not loud enough, cause you don't have no mic, no electricity, just carbide lamp around the place in the 50s. So when you're explaining the burru style of Rasta drumming, then when people talk about nyabinghi drumming, it's the same thing? Do you remember the first sides you recorded? Bwai, that is a very hard thing. I wouldn't remember which was the first tune. Because as boys we used to just do those things to get money. We cut for everybody, from Duke Reid, Prince Buster, Beverly's, Coxson [Dodd], you name them all, Pottinger. We play for a lot of people and some outsiders come in. This morning, Batman was playing some Owen Gray rhythm n' blues style stuff. You played on those kinds of tunes too? Yea man, that's where it started, rhythm n' blues. And then the music change. Coxson call me in the studio one day and say 'Lloydie, I wan change the beat you know? Find a beat.' Allright, I go inna the studio and I start some different different beat. Start with the burru style until I get on the second and fourth beat, everything down, and putting the rest of the stuff in weh. The second and fourth beat was the direct beat, and Coxson say 'yeah,' and that was it. That was the birth of ska? Yea. From rock n'roll and rhythm and blues we just change to [ska]. And everybody just catch onto the beat and like the beat. And everybody record everybody from Bob Marley, "One Cup of Coffee," I remember that. All them, Owen Gray, Delroy Wilson, Alton Ellis, you name them all, they pass through our hands. We did a show on the radio two weeks ago, ska, from his collection. [To Batman] The first two tracks you played you said are often called the first ska tracks . . .
Batman: Theophelous Beckford's "Easy Snappin." Was that the Prince Buster or was that Coxson? Batman & Lloyd Knibb: Coxson. CVP: And then there was a Prince Buster tune . . .
Batman: I saw an interview once where somebody claimed that "Humpty Dumpty" by Monty Morris was the first ska tune . . .
Knibb: Yea, I cut that tune, [but] that wasn't a ska tune. (Starts singing with rhythm guitar skank), "Hump-tee Dump-tee sat on a wall . . ."
Batman: What would you consider the first ska tune to be? I couldn't remember, but the first ska tune was done in Studio One, cause Coxson and I was in the studio creating, and I came up with this. CVP: We were wondering if some of the earliest indications of ska were also in the way the rhythm guitar was played. (Compare "Humpty Dumpty" and "Easy Snappin" -- cvp). Yea, the guitar have a lot to do with it. And a guy by the name of [Dennis 'Ska'] Campbell, who play ska, he play a tenor [sax]. And all he do in the studio was 'ah, ah, ah, ah, ah' (imitating Ska Campbell's skank sound) with the guitar and the piano. Everybody playing ska, but that tenor sound have a lot of thing to do with the ska. Is a hard thing is that. I hear them say is that cause Campbell to die, all he do is 'ah-hoo, ah-hoo, ah-hoo, ah-hoo!' [A fit of laughter from Batman & me at this point]. And that is everyday, all day, sometimes all night. Sometimes we go in the studio ten o-clock and we don't come out till ten o'clock in the morning, especially at Coxson's. Sometime we start in the night, sometime we start ten sometime we have a next session to do, two session in the day, one with Duke Reid, probably [one with] Federal, because Federal used to do a lot of things too. So we have a lot of things just line up. When you finish one session and going home, thinking to take it easy, there is somebody waiting at your house, seh well you're supposed to come pon us. Was there another set of session musicians that was kind of like a second team? Just one set of musicians which is just us. Drumbago used to play from in those days. I took over from Drumbago, because everybody like my beat more than Drumbago, so everybody leave him alone. So your beat was distinguished from his by the burru? Yea, him don't know anything bout burru beats. Cause he wasn't spending time with the Rasta drummers? No, he wasn't around that. Him was a different kind of guy, a quiet guy, home-ly guy [liked to stay at home --cvp]. Him never acquainted with my kind of style. I was also curious as to how Count Ossie got his opportunity to get into a recording studio, considering, I understand at the time that Rastas were cast aside. No, no, no, no, not like that. No sir. Everybody always say bad thing about Rasta, but you have good and bad in everything. And the bad one is few. So he came to the studio with Duke, both of us in the studio together. His band set up and I-man I set up, recording, and when it finish recording, the drum playing, and we dub over that. So that is how them used to do. Sometime Count Ossie alone, with Bunny & Skitter. Bunny & Skitter was Count Ossie singers. What do you remember about hanging out in his yard? It was good man, everybody free. All musician used to go by Count Ossie, every musician. Everybody always meet, especially on Sunday night time. Everybody bring them horn and play off the drum. So is thing coming up from beginning. [Reading the label credits] "Anthony Morris, Mello-Cat, Count Ossie, Warikas, Roland Alphonso and His Alley Cats . . ." The Skatalites never form in these days, never form as yet. But is the same group, the same group. Cause right now everybody who done session, from they find out we are on the road, and we are on top of the new ska music over here now, and we selling, Heartbeat start put [cds] out, Coxson, you name them, Randy's start put out cds. One other question came to mind, cause I was reading [Brian Keyo's] liner notes to the Heartbeat collection, and he talks about Sonny Bradshaw's drummer Donald Jarrett. He is a guy I try to play like, cause Donald Jarrett, when I was a little boy, he used to have a jazz band. So they have this different man, different different musician from different different band. In those days, all the best jazz man. They have a twelve or a fourteen piece [band]. So they used to practice over Beason Street, 50 Beason Street. And I was living at 116 West Street, so is close, just round the corner. So I used to go over there every day and sit down behind him and listen to him and watch him. And listen to how them argument and listen how them talk and count. So every day that gwan for about a month. So when I'm gone and I'm finish now, I go over my house and take up two pan and start get my lickle practice. Yea, start and make a ting and gwan! I end up going to the Coney Island now. A guy name Lionel Proba(?) make a drum for me, cause you never have no music store in Jamaica. But them can make the drum. And him make the drum, make the pedal, make the drumstand, make everything, just the bass drum, the tom-tom, and the high-hat. Them make it different out of something else. And make the cymbal stand different, so that was my lickle drum [that I took] to the Coney Island to play, every night, two shilling a night. You have some other places play five shilling a night. You start from eight o'clock and you done twelve, playing in this Coney Island -- a gambling place. Who played with you at that? Different different musicians. Those guys wasn't studio guy. Those guy was long before studio [recordings]. All these was long before studio. Studio never come until in the 50s. This was in the 1940s? This was in the 40s. I was about sixteen, seventeen them time. Just coming in this music thing. That's where Gabriel come and listen to me and say when him want a drummer, and I was right there. So I get a lot of practice in the band and learn more stuff. Gabriel is my friend, so in those days I always go down there. Sonny always listen to him and give me a practice. And how them count, cause I never know. Everything (seem to me as) 'one, two, three, four, five, six, seven' . . .no! Is One, two, three, four, Two, two three, four, Three, two, three, four, Four . . . so I sit down and listen and take in everything. I am self taught, so I always among the musician and listen how them talk and what music [them listen to] until I get into the vibes. Yea. Tell me then about when the beat slowed into the ska-steady and rocksteady, how did those changes come about? Well, we used to cut a lot of tune for Duke. He said to Tommy, the people them kinda getting oldish, so cut down the tempo, so we cut it down and call it rock steady. Just slow the beat down, but is the same second and fourth beat. Alton Ellis was the first guy start this rock steady. So after that, him come and say again, slow the beat down one more time, and you call it reggae. Same kind of beat, second and fourth. So that was it. We have three stage of the music: ska, rock steady and reggae. And you were with Tommy and the Supersonics? Now Winston Grennan and Hugh Malcolm and some of those drummers, didn't they play an important part? Malcolm used to be in the studio with me. So he watched me a lot and listen to me a lot because he can play also, but him don't have the direct ska beat. Him can play ska, but him don't have the beat. Cause I used to go out on Sunday evening and late to come back, and him would set up the drum and make them the start the band. He is a good friend cause we in the studio together. So them come up watching me and listening to me, but I don't think he was in any big band stuff, just when ska music start and the rock and roll thing. What about [Studio One session drummer] Bunny Williams? I taught Bunny Williams to play the drums in Montego Bay. And the next guy by the name of Palatos. Palatos want to play congas, so he bought a pair of congo drums. So all of us used to be up by the Three Store building. All of us live together. Bunny live deh so. Palatos live next to [me]. So Palatos came with this drum and say him want learn to play, so I give him a beat to hold onto. 'Tu-toom pom, Tutu-toom pom.' And him say alright and him go out and see if him can get a job playing with a calypso band. So him come back and say, 'bwai, man deh seh dem cyaan use me.' Me say, 'how you play?' Him say, 'like how you show me.' Me seh, 'me show you now.' And I take the drum and show him how to play: 'Boom, boom'm'pom tu-toom pom to-toom-um-poka-pom,' until Palatos go and practice and practice. Him playing three drums now. Well, Bunny Williams, I taught him. And when Skatalites band mash-up, and they had Soul Brothers, I was on the ship those time. And I came back and was [at the] Orange Bowl listening to the band. And Bunny saw me come in, and say, 'bwai breddah Lloyd, me cyaan manage the ska thing. Me can't manage it.' So he gave me back the sticks, and I never go back on the ship. I just stay with Soul Brothers. And Soul Brothers never last me a long time. Did a drummer named Joe Isaacs play with them too? Batman: One Soul Brothers album credits Joe Isaacs, but I don't know if that's accurate. CVP: There's a picture [on the album] of a drummer, and it's not you. Batman: I think that Soul Brothers album is different because it doesn't have Roland Alphonso on it. Yea? Well, it's Roland used to run that band you know. CVP: You never know when Coxson puts something out, what it really is. That album is unusual because it actually has photographs of everyone with their instrument. And then did you know the next drummer at Studio One, his name was Phil Calendar? How long were you off doing that? About six years. Two different ship, until I came back and start working with Cecil Lloyd (jazz pianist, also worked at Studio One --cvp) and Len Hibbert (vibrophonist, also worked at Studio One). I work with Cecil Lloyd for twelve years. I work with Len Hibbert band for seven years in Ocho Rios. So all my life is just hotel. After the Skatalites break up and everybody scatter, I was in hotel playing. I used to live in Montego Bay. That North Coast scene. And then did you have solid work with the Skatalites once the Sunsplash  took place? Well, after Sunsplash it was over again, until Tommy came to the United States in 85 and decide that he want to form a band, but he tried out Winston Grennan and other musician, trying to recreate the ska, but they didn't understand what's happening. They couldn't get no work, cause it wasn't good. So a guy by the name of Herbie Miller set up a thing with Tony Johnson [Sunsplash promoter]. The whole set of musicians was just coming here so they just put us on the list. Send the visas, and we pay and go reach. From we reach the band form, and that was it, 86. And we start get job. [We] start with the Village Gate for about a month, playing at the Village Gate every night. Johnny Moore wasn't there. He came to play with us, and him say him cyaan stay, so him didn't stay with us. It was a different trumpeter. Johnny never play. He still plays for Bunny Wailer. Yea, he still in a band with Bunny Wailer. One last thing, back to the subject of the traditional drumming. I also hear about something called Jonkanoo. What is that? That is around Christmas time. Some guys dress up like queen face and different mask, like Halloween. Those kind of dressing, you call it masquerade. So they dress up man in . . . different different kind of costume [and] like a float on the road, dancing, and the drum is, 'blook-a-took-a-toomp-toomp,' and the fife a go, 'dee-nah, dee-nee, dah-dee-nee.' And then them dress up all like the devil. And the crowd following them dancing, going on. Some time I follow them and get lost when I was a little boy. I live on West Street, and I'd [be] following them dancing going and get lost. Like the Pied Piper. . .
Bwai I'd get lost and say, 'what am I going to do now mon!' I'd start make noise bawling and tell them I live on 16 West Street, and them show me which part go walk down. It was alright. When I was in Jamaica last time, I went to St. Thomas and heard some kumina drumming. Same kind of burru thing, but is a different sound. Yea, is like the masquerade them use that kind of thing, same kind of thing, yea mon. You were always credited as 'Knibbs' until recently they started putting it with no 's' on the end. Oh boy. K-N-I-B-B. They put it wrong on a check! And I get it to change still, cause is me same one. Some say K-N-I-B-B-S, some say N-I-B-B-S. I haven't seen it spelled correctly until probably two years ago. All the old records are wrong! Allright thank you very much for the time. Thanks to Dan Schlissel for inadvertently helping this interview to happen. Thanks to Batman for a nice amout of knowledge. Good works!